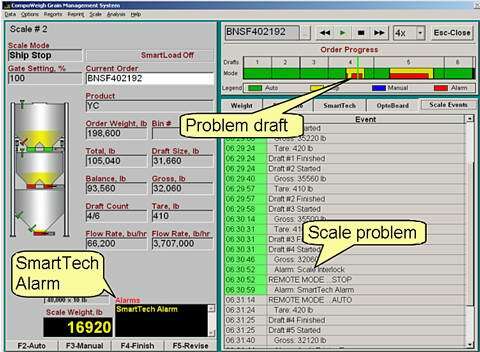 SmartPlay is a breakthrough product that allows a Manager to run a ‘movie’ on any order run on his bulkweighing scale, just as if he had a TIVO Remote in his hand. How long the whole operation took and compare it to previous load outs. Check the average load out speed. 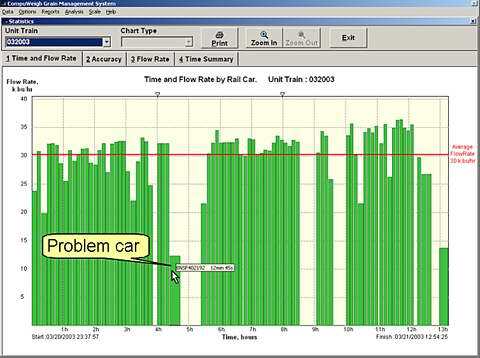 Look at the dead time between strings of cars. Select a car for special review. In our example we are going to take a look at car BNSF402192, which for some reason took 12 minutes and 45 seconds to load. (Slow loaded cars have ‘short wide’ bars). GMS now loads that car onto the screen. The screen is our normal GMS-4000 screen so the manager is familiar with all its features. side of the screen will fill and empty, gates will open and close exactly the same as when the scale originally ran. 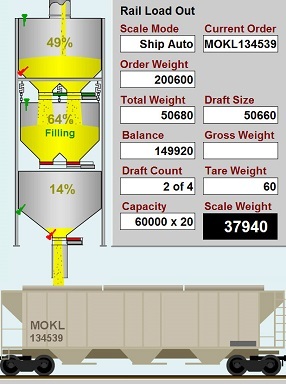 The graph shows the weight changing in the weigh hopper during the fill and discharge cycle. At the top right hand side of the screen are the ‘DVD’ controls, so the green slider can be moved to any starting point, (or even faster, just click with the mouse anywhere on the strip and the movie will start from that point). In our example we have clicked on the start of draft 3. The Legend explains what mode the scale is running in (Auto, Stop, Manual or Alarm). Also note the speed control box. Here we are running at ‘1x’ or normal speed, but we can run the scale at a number of speeds up to 8 times normal speed, down to a super slow speed to really follow the steps that the scale went through. Now let’s take a look at the problems in Draft #4. 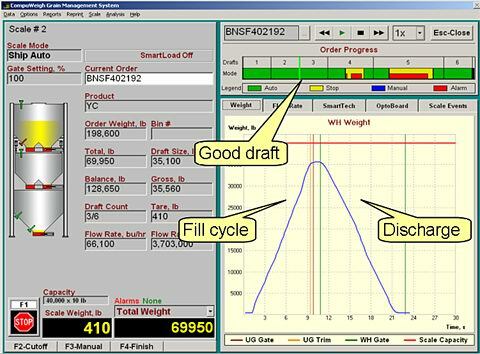 The manager clicks in the Draft 4 box and can then choose any of the 5 tabs (Weight, Flow Rate, SmartTech, Opto Board and Scale Events), to see a particular aspect of the scale. Let’s click on Scale Events. We can see there was a SmartTech Alarm and the scale automatically stopped. Let’s go and see what SmartTech thinks is wrong. 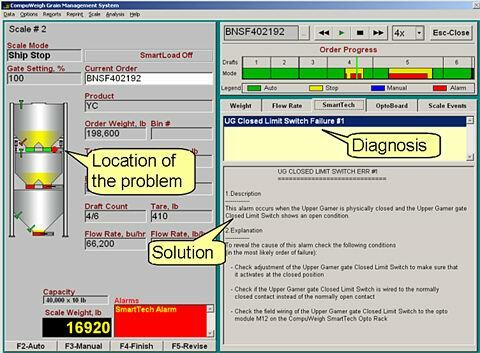 SmartTech has determined that there is a fault with the Upper Garner Limit Switch. Note the red spot on the scale by the limit switch. (This would be flashing in the program). The manager can then read the instructions on how to fix the problem. 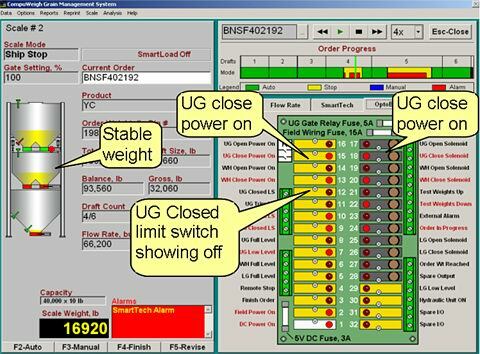 If the manager is interested in the details, he can click on the Opto Box button for a more thorough explanation of how we know it’s the UG limit switch. We instructed the upper gate solenoid to close (#18). There is product in the weigh hopper and the weight is stable. Therefore the gate is closed, so it is not the gate solenoid but the limit switch that is at fault. Let’s assume that we fix the limit switch. 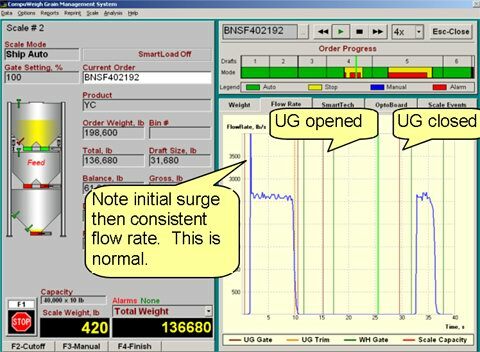 The Manager can then click on to the Flow Rate tab and we can see the time lost during the repair and that the scale is now working normally. (Note the initial surge in the flow rate when the grain first hits the weigh hopper bottom. This is perfectly normal as long as the flow rate flattens out after the surge). 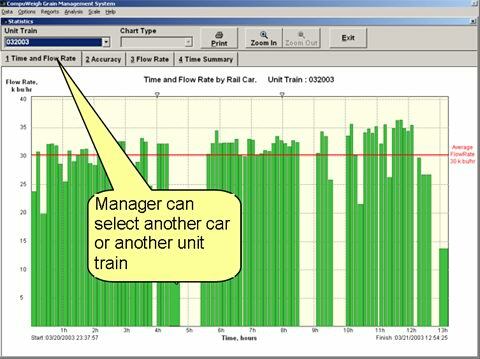 Select another unit train for analysis. SmartPlay is another first from CompuWeigh and is part of a family of products dedicated to not just getting the job done, but getting the job done better. Recommended for all automated bulkweighing systems but particularly beneficial for High Speed Rail Loading operations. GMS-4000 Bulkweighing System with the SmartTech Opto System.